What more is there to say? Nothing. What more is left to do? Nothing. 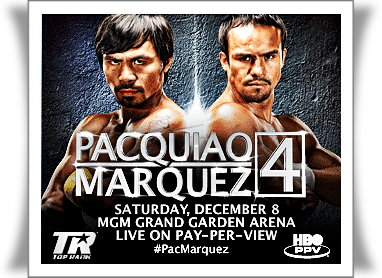 Who would have thought that there will be a fight for the fourth time between Manny Pacquiao and Juan Manuel Marquez? Did you happen to predict this? Not that I am complaining. But have you heard about the "sawa" factor? Anyway both boxers are looking as ripped and ready as ever when they had a weigh in last December 7, 2012. The fight between the two great fighters will happen later this morning Pinas time ( Dec 9, Dec 8 in the US) live at MGM Grand Garden Arena in Las Vegas, Nevada. So stay tune for the live blog update!